Y Ravine itself is densely overgrown and it is virtually impossible to find a way down to the beach. However, there is a navigable path running down the north shoulder of Bruce’s Ravine, just north of Gurkha Bluff. It is steep and overgrown and it would not be sensible to attempt this on one’s own or in anything but dry weather. Good boots and a stick are highly recommended. I have made this descent on two occasions, both in the company of other walkers. A reasonable level of fitness and mobility is needed. Using the course of Gurkha Mule Trench as it approaches the slope to the sea, the path is fairly discernable, especially where it runs along the right side of a revetment wall. The lower part of this descent shallows off as you near the sea. Once you are on the narrow foreshore, turn left and walk for about 50 metres southwards to reach Y Beach itself. From here, you can look back up to the distinctive depression of Y or ‘Gurkha’ Ravine. Y Beach was the scene of landings by the 1st KOSB, SWB, Plymouth Battalion and Royal Marines on 25th April 1915. The beach is hardly more than a rocky foreshore, but opposition was minimal and by mid-morning troops could be seen on the cliffs above. 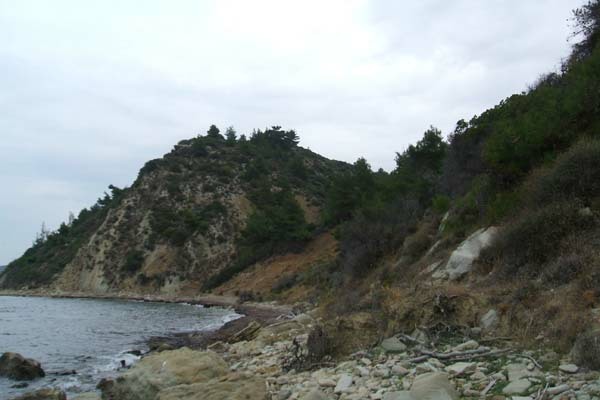 Scouting parties crossed Gully Ravine and came within view of the village of Krithia. It was critically important to push quickly inland and southwards to link-up with the landing troops at X Beach, but this action was not taken, and lack of artillery support and rapidly increasing Turkish opposition led to an almost spontaneous evacuation on 26th April, spurred on by confused orders and lack of communication. It would take several weeks and hundreds of lives to retake this position from the arduous approach up Gully Ravine. Image below: Y Beach looking northwards towards Gurkha Bluff. The descent path from Bruce’s Ravine is in the green scrub on the extreme left of the photo.